Heavy rain (всего 47.0mm), heaviest в пятницу утром. Later becoming colder with a dusting of snow в субботу после обеда. Very mild (максимум 12°C в четверг после обеда, минимум 1°C в субботу после обеда). Winds increasing (слабый ветер с западо-северо-запада в четверг утром, почти штормовой ветер с северо-запада к утру субботы). Light rain (всего 7.0mm) at first, then becoming colder with a dusting of snow в воскресенье вечером. Freeze-thaw conditions (максимум 5°C в понедельник после обеда, минимум -4°C в воскресенье вечером). Winds decreasing (сильный ветер с западо-северо-запада в субботу вечером, слабый ветер с западо-юго-запада к вечеру понедельника). Таблица выше представляет прогноз погоды в Mount Snow, сформированный для определенной высоты: 838 m. Наши уточненные погодные модели позволяют дифференцировать прогнозы между вершиной, серединой и нижней точкой катания на склоне Mount Snow. Чтобы переключаться между ними, используйте линки выше таблицы. Чтобы получить предоставление об изменении погоды в регионе в целом, попробуйте наши Погодные карты для United States. Middle-of-the-plate pitch for a New England resort with one caveat: If you're a park-rat (grom to shred; I'm not) Carinthia is the best terrain park in the East, walking away, with a whole face dedicated to jibbers. 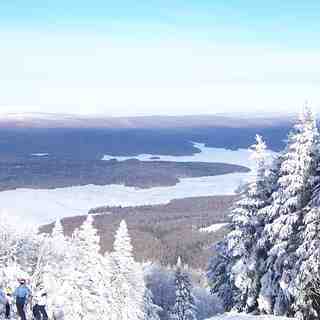 As a whole, resort favours the intermediate skier with primarily groomed terrain. However, they have a boundary-to-boundary policy in place for when the snow flies. There are a variety of tree runs for all ability levels when there's snow. Trail style runs the gamut from wide-open (Snowdance) to old-school Northeastern trails (Uncles). The "North Face" has decent incline; "Jaws" can be a real treat with good coverage. When there's no natural snow (and when there is) I think recent improvements put it in the top rank for snowmaking, nation-wide, actually. All that said, this is an intermediate hill. A good place to progress your skiing but not an advance/expert playground-for-days. What sets it apart from other Vermont resorts (*cough* Stratton *cough*) is the laid-back, unpretentious vibe. People come here to ski and be with their family and friends, and that's it. Most of them will be happy to see you, too.